Let’s keep red, white and blue on display longer than just for the 4th of July! 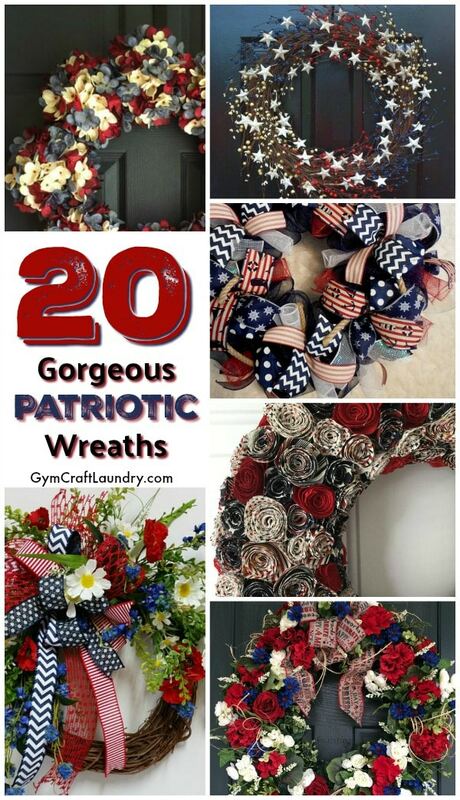 There are so many fun and beautiful patriotic wreaths and they are perfect for Labor Day, too. Adding some Americana decor is just one way we can show support for our troops! I couldn’t believe how many different ways you can make wreaths that are SO CUTE. Choosing from the 20 wreaths below seems almost impossible. There are so many different options that will go perfectly with the rustic look that I love. Some have incorporated flowers, ribbon, pine cones, fabric, flags, etc. So have fun looking! I love showing support for our troops in any way I can. And how easy is putting a cute patriotic wreath on your porch? So easy! Weather it’s winter or summer, these wreaths will look adorable through any season. You can get creative and use different ideas to make your own unique wreath. Or just buy whichever one you love the most and hang it up! Such a gorgeous, colored flower wreath! Love this mixture of flowers and ribbon on the wreath! This tea stained wreath is beautiful! I don’t know how this burlap wreath was made but it’s so cool! Fun and cute flag wreath! I LOVE this grapevine wreath! I’ve never seen a square wreath but so cute! Such a gorgeous flower wreath! Love this ribbon flag wreath! This “home of the free because of brave” wreath is so cute! This wreath looks like a garden… love! Super fun God bless America wreath! This fabric wreath is so creative and cute! Can’t get over the flowers made from fabric on this wreath! “America my home sweet home”… adorable wreath! Hopefully you found the perfect new wreath for your house! I know I found at least a few! It’s easy to forget to show our support but it can be so easy! I think wreaths really spice up any front door and any of these would add so much to your home. What’s your favorite thing to have incorporated in your wreath? Let me know your favorite thing to have in your wreath! And don’t forget to pin this tweet so when you’re ready for a new wreath or want to give friends ideas, you have them on hand! Want to check out some DIY Patriotic Summer Wreaths?